A composite cutoff wall consisting of HDPE geomembrane combined with soil-bentonite backfill can be effectively applied to site remediation projects. 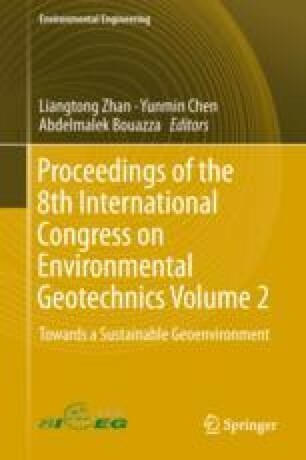 This technique was firstly successfully applied by Beijing GeoEnviron Engineering & Technology, Inc. (BGE) in a copper-containing acidic liquid leakage project in China in 2011. Then, BGE successfully applied and promoted this technique in many other projects in recent 7 years. Some specific key sealing materials were developed to achieve the effective bonding between geomembrane and bedrock and clay aquifers. In addition, a special machine for installing geomembranes was also designed. The maximum geomembrane inserting depth on site reached to 32 m. Geomembrane composite cutoff wall is considered to be currently the safest and most effective vertical barrier technique to block horizontal pollution migration.